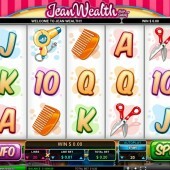 Plunging you in a world of blow-dry, blue rinse and bobs, slot developer Leander Games's Jean Wealth - or Jean Wealth Hair Salon to give it its full title - is a video slot set in – you guessed it - a hairdresser's. 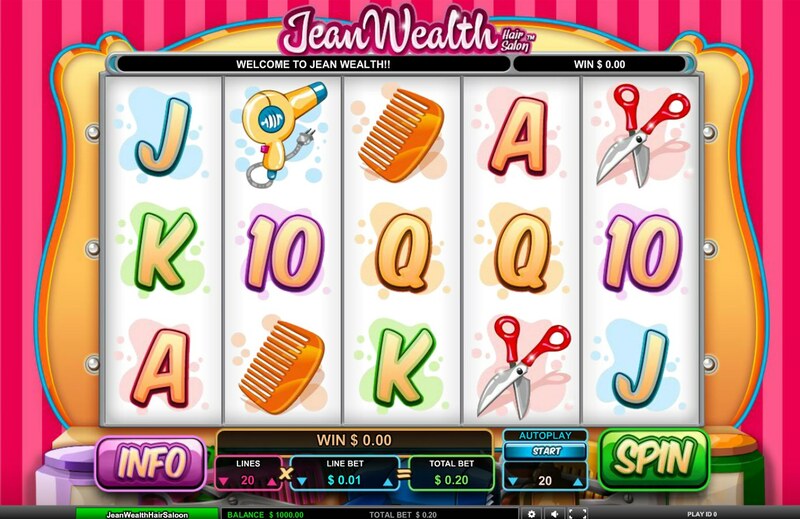 A 5 reel, 20 pay-line slot, Jean Wealth is full of hair salon icons and garish pinks across the reels: male and female models, a comb, hairdryer, scissors and nail polish are the symbols on offer here, as well as the regular 10-through-Ace symbols included for good measure. The Wild icon substitutes for all regular symbols other than the Bonus and Scattered Nail Polish, and five Wilds across the screen will bag you a 5,000x line bet win. The Scatter is the red nail polish icon, but it’s the two Free Spins icons – one male, one female – you should be looking out for, as three of any of either on reels 1, 3 and 5 triggers the “Fashion” Free Spins Bonus. First you’ll get to choose how many spins you receive by picking a hairstyle. Behind each one is hidden a different amount of spins with a different multiplier. You can get up to 10 free spins with a 3x multiplier. Three Bonus symbols on reels 3, 4 and 5 triggers the “Fortune Hairstyle” Bonus. You have eight chances to give each customer the hairstyle they want. Bonus wins are multiplied by your total bet, and with a top payout of 12x your line bet that could prove to be a tasty amount indeed. Agent Jane Blonde, the spy-themed slot from Microgaming, is close to this slot in terms of style, with its lipstick n' guns icons, but Top Games's Beauty Salon probably pips Jean Wealth in terms of slick graphics and great bonus rounds. As it is, there’s certainly plenty of Leander’s customary professionalism on show, but with some pretty basic bonus rounds, you may want to get your ‘cut’ elsewhere.